Charles T. Ray, aka: Pony Deal or Diehl (1849-1887?) – Though not nearly so well known as other gunfighters of the American West, Ray, who is far better known in history as “Pony Deal,” rode with, met, and fought with some of the most infamous characters of the West, including names such as Billy the Kid, Wyatt Earp, Ike Clanton, and numerous others. Hailing from Rock Island, Illinois, Ray, first appears in history, going by the name of Pony Deal, as a member of the John Kinney Gang in New Mexico in the 1870’s. The members of this gang were successful cattle rustlers and hired gunmen that operated in the area of Dona Ana County. On December 31, 1875, Deal, along with gang leader, John Kinney, Jesse Evans, and Jim McDaniels entered a saloon in Las Cruces, New Mexico, where they became involved in a brawl with US Cavalry soldiers from Fort Stanton. When the outlaws lost the fight they were thrown out of the saloon, but the vengeful men couldn’t let it go. They soon returned to the saloon and opened fire through the windows, killing two soldiers and a civilian, and wounding two more soldiers and another bystander. Deal rode with the Kinney Gang through 1875, and in early 1876, he left the gang to join with Jesse Evans, who had departed to start his own gang. This gang was actively involved in cattle rustling and armed robbery, and for a while Billy the Kid rode with the gang. They were soon enlisted by the Murphy–Dolan faction in their feud with John H. Tunstall in Lincoln, New Mexico. 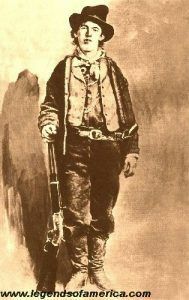 At this time, Billy the Kid quit the gang, as he was a friend of Tunstall. After the killing of John Tunstall by the Evans Gang, it sparked the Lincoln County War, during which Evans and his gang would match up against their former partner Billy the Kid and his “Regulators.” After the end of the Lincoln County War, Pony Deal drifted on to Tombstone, Arizona, where he met and became associated with Ike Clanton, Billy Clanton, Frank McLaury, Tom McLaury, Johnny Ringo and “Curly Bill” Brocius, becoming part of the Cowboy Faction. 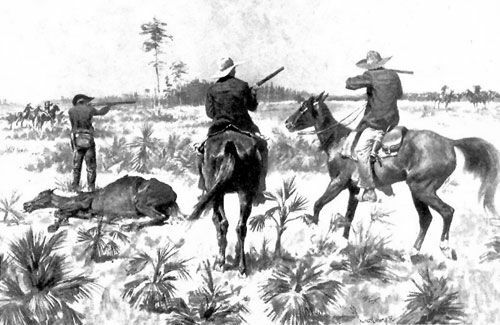 Deal was involved in various events that led up to the Gunfight at the O.K. Corral. He was suspected of being involved in numerous robberies and cattle rustling, as well as being involved in the theft of US Army mules, alongside Sherman McMasters. After the assassination attempt on Virgil Earp, in which Virgil lost the use of one arm, the Earps suspected Ike Clanton, Phin Clanton, and Pony Deal in the murder attempt. He was sought after by Wyatt Earp during the Earp Vendetta Ride but wasn’t found. Later, he would claim to have killed John O’Rourke in 1882, after O’Rourke allegedly killed his friend, Johnny Ringo. That same year, he was running from the law when a warrant was issued for his arrest relating to a stagecoach robbery. Again, he avoided capture. He then drifted around, spending some time in El Paso, Texas and rustling cattle again for John Kinney. He was finally captured and sentenced to five years in prison at Santa Fe, New Mexico. He escaped in February, 1885, but was free for only four days before being recaptured. Returned to prison, he was released in March, 1887, after which time he disappeared from history, although some accounts say that he was killed in a gunfight.